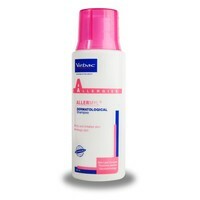 Allermyl is a neutral pH unscented shampoo, used to help soothe irritated skin. Allermyl contains vitamin E, Linoleic acid and gamma linolenic acid (omega 6) and piroctone olamine. Use Allermyl, shake well then wet the coat with warm water and apply a thin layer of Allermyl shampoo from the base of the neck to the base of the tail. Massage into the coat with circular motions and rinse. Repeat and then leave on the coat for 5 - 10 minutes. Rinse thoroughly with clean water. Use once or twice weekly or as directed by your veterinary surgeon. Mild Cleansing Agents, Monosaccharides/Alkyl Poly Glucosides (Virbac Glycotechnology), Skin Lipid Complex (ceramides, essential fatty acids, cholesterol), EFA (omega 6), Piroctone Olamine, Physiological pH.